I hope this is the right spot in the forum to post this. For a little over a year, I've been working on a tabletop arcade project. I decided to do an NHL 94 theme. Enjoy and feel free to ask any questions about the build. I thought of doing something like that just build it around a TV. Thanks! It works great. There is a mini ITX PC inside running Windows 10 and Hyperspin/RocketLauncher. Joysticks and buttons all work, they are wired into an Ultimarc iPAC. That is simply beautiful! Looks friggin' amazing, so well done. I'll double halifax's price. Seriously. Would you sell it? Or build 4 more because I want one also. You may have a small business on your hands. And how do we get one to Vegas for KO94 2. I have a business proposal. 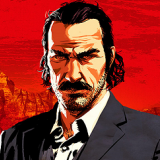 Since Mikey will double my price. I'll say I'll give you $500,000. You build two more and give me one for free and you become a millionaire! Everyone wins! That's just too cool, I love it! That is really nice work! Wish you had a Youtube "Making Of" video? I salute you, Sir! I went with Sanwa JLF Joysticks for a few reasons. I had already done Bat Top Happ Joysticks in my previous build so I wanted some variety. Also, I thought they would work well for the occasional game of Street Fighter. The artwork is custom, my design with art lovingly borrowed from NHL 94. The side art is a super high res scan from the front of the Geneis box and I added the logos on the bottom. The artwork on the CP and the zamboni on the front panel were high res screenshots pulled from Fusion. The bezel was the most time consuming part. I loaded up Fusion, selected the first 2 teams, captured that screen, opened the capture in photoshop and cut out just the logo and placed it on my Bezel image. Took a little time but the result is fantastic. All of the logos have that classic feel. 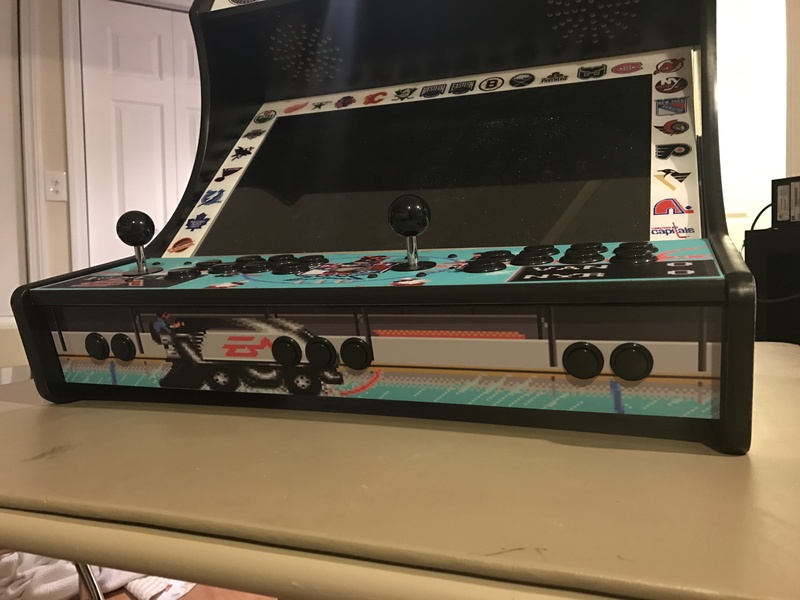 I wouldn't sell this particular one, but if anyone really wants one, I can put together pricing for all the components so that you can assemble one: The cabinet, keyboard encoder, buttons, joysticks, marquee, bezel, artwork, basically everything except the PC and monitor. I could even apply all the artwork for you and then ship it to you. Hit me up if you are curious about pricing. If this isn't the type of work you do for a living, you have a calling, sir. Just more amazing everytime I look at it. Thanks, man. Just a hobby for now. Been playing and collecting games for a long time. Over the last few years, I've been leaning more towards the arcade stuff and I like making custom things too. If I could replace my day job's income with this kind of work I would do it. I'd even take less, all about being happy, right? As long as the wife and kids are taken care of. I;m good. That side art is actually from NHL 95 and it looks like the game is actually the Sega CD Version. Not that it takes away from the awesomeness of this project. Segathon. I've been playing 95 a bit and having lots of fun with season mode with a rebuilt Oilers team. Maybe I will make a Segathon someday. That is amazing - sir you are a true artiste! Dirp, you're right. I used NHL 95 art because I'm a big NYR fan (same reason for control panel art, 94 Game 7 face off) but I used the NHL 94 Logo, felt more iconic. Needless to say, that thing is awesome. 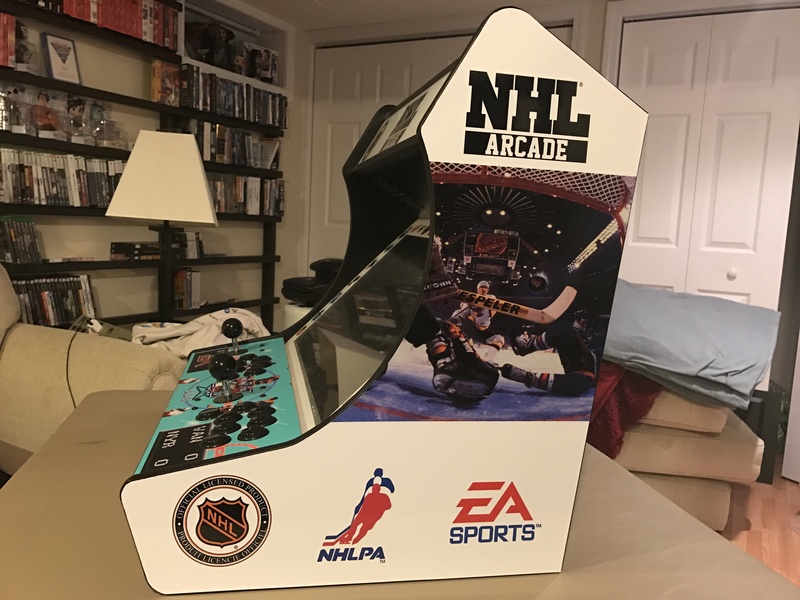 I love pretty much everything about this - the "NHL ARCADE" logo, the zamboni, the faceoff image, the NHL, NHLPA and EA logos, and all the little team logos around the screen. I think the side panel art from 95 goes great. It goes with the whole NYR/VAN theme, and is recognizable as a EA NHL series image. Best thing I took from this thread is your "Favorite Way to Score: blueline slapshot" . A man truly after my heart!!! Great work. BIG TIME KUDOS bro. I'd have to give this a try some day. I'd have to have plug ins for the joystick though that attach to the front. NO WAY I could play NHL94 with that joystick nor would it LAST past a month of my abuse!!! (could you imagine this machine with a Lupz or me POUNDING on it!?!?!) lol. I knew there was a reason I loved it so much. The White does look clean! And the NHL 94 colors on the joysticks look better than what a 95 pixel would show. Great mashup. Segathon is Feb 11 at a Buds house in Minneapolis. You are always welcome to come! There is still dreams of doing a Vegas Segathon someday as well. Actually we have a couple other guys from Vegas that has reached out as well about segathon via the twitter machine. haha....He's a leading candidate less than a month in! Cabs rarely turn out this nicely. I'd guess that this is not your first rodeo? 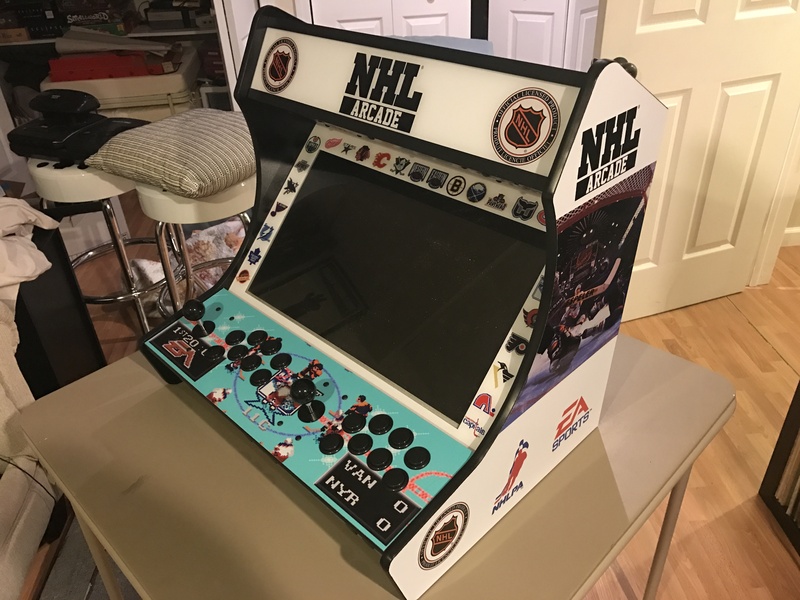 Are those Sanwa sticks and buttons; how does it feel playing NHL94 with clicky-sticks? You answered above and I missed your post. Beautiful bar cab you have; very nice work. Does the marque light up as well? I refurbished an Astro City cab in 2014 and it took me a year, but I ended up selling it. Never did setup '94 on it, but looking at yours makes me wish I would have. If anyone wants to see the cab in person I'm bringing it to RetroWorld Expo in hartford, CT on October 14th and 15th of this year. King Ralph will also be there running the NHL 94 Tourney. Damn Bil, that would be a thing of beauty to see in person. I've never built one....but this might help.